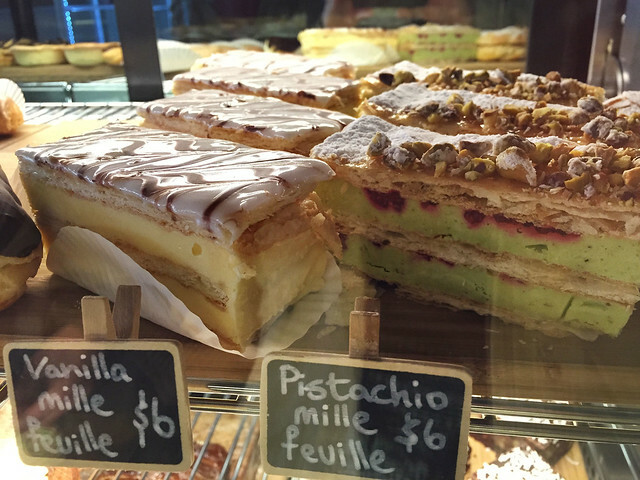 I’ve already reviewed St Malo Bakery in this blog, awarding a 9/10 for their fancy “pistachio and raspberry mille-feuille”, which was deemed close enough to a vanilla slice to count. But the other day I was walking past and popped in to buy a loaf of bread, and lo! 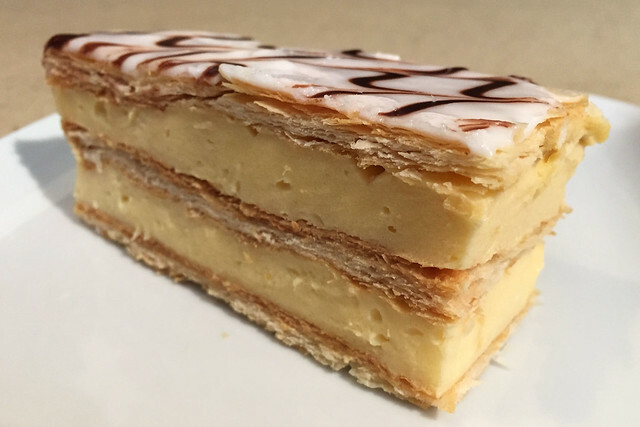 Sitting there in the counter display were not only some of those fancy slices, but also some plain “vanilla mille-feuilles”! Excited beyond belief, I ponied up to the counter, ordering my loaf of bread, “and a vanilla slice, please”. This achieved the desired result, and I stole away from the bakery with a light rye sourdough loaf and one of the vanilla mille-feuilles in hand, packaged with great care in a small cardboard box and then a paper bag for consumption off the premises. Attacking the slice later in the comfort of home, I observed that it was very much a traditional style vanilla slice, with three thick layers of pastry sandwiching two moderate sized slabs of pale yellow custard. The slice was topped with a thin layer of hard icing, white with expertly piped brown squiggly lines on top. Someone had spent 5 years in a French patisserie school just to do that icing. 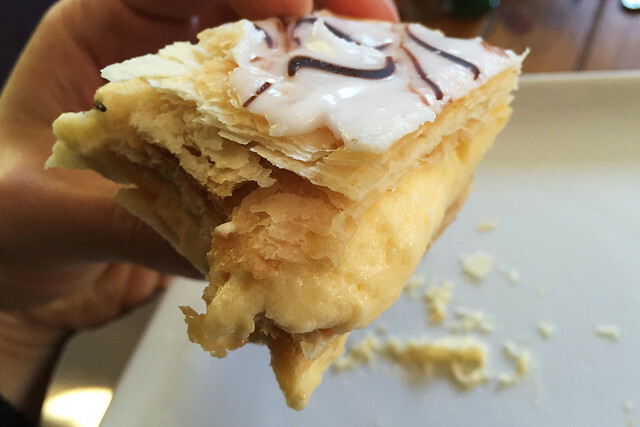 It looked just like a very well made Aussie vanilla slice, with only the name written on the tag back in the shop betraying its origins in a swish French bakery. The slice picked up cleanly, but turned out to be a bit of a task to eat, as with the previous pistachio and raspberry version. This was due to the crispness of the pastry, which squeezed the soft custard out on all sides before finally yielding to bite pressure and snapping with a clean, crisp crunch. The icing was also incredibly sticky, with a couple of fingers firmly planted on the top layer being unable to move without intervention from the other hand. The construction slid about and was difficult to control, but I managed to eat it without spilling any. And the eating itself was a sheer pleasure. The custard is smooth and creamy, with a nicely balanced blend of mild sweetness and vanilla flavour. The pastry is, frankly, to die for. I could just eat a sheet of that pastry by itself and be happy. It is thick and composed of hundreds of delicate crispy layers, perfectly baked to a high crunch. The crunchiness of the pastry is a perfect foil for the smooth softness of the custard. The icing is sugary sweet, but restrained in its wafer thinness so that it complements the subtle flavours of the custard and pastry rather than overwhelming them. The whole suite presents an explosion of all the textures and flavours you want from a vanilla slice mingling in the mouth. Last time I docked a point from St Malo’s pistachio and raspberry mille-feuille for being “too fancy” and deviating from the traditional vanilla slice recipe. This vanilla version doesn’t have that excuse, and I can only hold my head high and declare this vanilla slice a most emphatically worthy winner of the first perfect score on Snot Block & Roll.